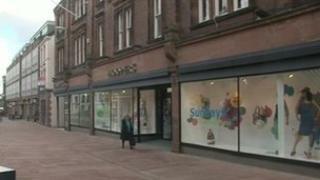 A department store in Cumbria is expected to close with the loss of 83 jobs. Staff at the former Bulloughs store in Carlisle were given the news of possible closure on Tuesday morning. In a statement on its website, Hoopers said the store in Carlisle would continue trading until the possible final closure on 23 June. A period of consultation has begun with staff, with Hoopers saying its other stores are unaffected by this closure. Hoopers first opened in Castle Street 2006, and Carlisle Labour council leader Joe Hendry said it was disappointing to see the closure of an "iconic" store. "It sends the message out throughout Carlisle that we're getting close to crisis point. We need to do all we can to make sure we don't get to that crisis point," Mr Hendry said. "I have a real concern that it's going to get worse before it gets better. So many of us feel very helpless about it." Anne Horton, managing director of the Hoopers group, said the losses the Carlisle branch had incurred made permanent closure likely. "It is the economic situation really that has determined the position we're in at the moment. "We have tried very hard, we've looked at all sorts of other opportunities, but it is not an ongoing viable proposition," she said.